Some men are drawn to women – some men are drawn to murder. In this captivating story of strange obsession Kathleen Conley (Lucille Ball) and her boss Brad Galt (Mark Stevens)are caught up in something shockingly different…and terrifyingly dangerous. Galt has a secret so terrible; he might have to kill to keep it. In the midst of their budding romance Kathleen and Galt are being tailed by a heavy-set man in a white suit (William Bendix) and though she doesn’t know why or how strong the threat is Galt does and he is prepared to go to extreme lengths to protect himself. This soon leads to a murder mystery, where Galt has to clear his name while on the run from the law, that ties into a romantic triangle (no, not with Lucille Ball). It’s a very entertaining film, and I enjoyed it very much, especially the unexpected happy ending. 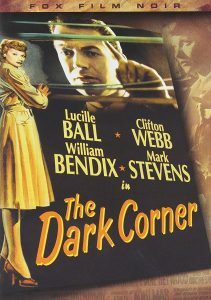 The Dark Corner can’t seriously be proposed as a great film noir, but it’s one that people cherish. For one thing, it’s unique in having Lucille Ball who has absolutely no “splainin'” to do–as the smart, resourceful, devoted secretary of beleaguered private eye Mark Stevens. Lucy actually rates top billing, with Clifton up-to-his-old-Laura-tricks Webb and William vicious-brute-in-a-white-suit Bendix also getting their names above that of the hero in the credits. In this, there’s a certain justice; they all deliver the goods, whereas Stevens seems a tad lightweight as the hardnose, Phil Marlowe type cracking wise and punching his way through the mean streets. His character comes burdened with more backstory than usual for movie detectives; this time, the case the private eye has to solve is his own. The intriguingly convoluted screenplay (by Jay Dratler, who co-wrote Laura, and Bernard Schoenfeld, from a story by Leo Rosten) takes hold like a vise and sustains the tension even though, by rights, its credibility should be shrinking with each passing reel. Lucille Ball has a change of pace role as the loyal secretary of a private eye in this brooding film noir about a man being set up for a murder rap. Framed by his partner years ago, hard-boiled detective Bradford Galt (Mark Stevens) served a two year stretch for manslaughter. Now trying to start over, he spends his time serving his clients and romancing his new secretary, Kathleen (Lucille Ball). But everything changes with the appearance of a sinister man in a white suit (William Bendix) who’s apparently working for Galt’s ex-partner, Tony Jardine. When Jardine is killed, the police blame Galt. It’s another frame, but if Galt can’t prove he’s innocent, this time he’s headed for death row.